Mighty Oaks Business is an innovative, engaging networking group combining more than 50+ local companies and specialists. This year we are looking to grow our network, not just via local companies but also via our vast array of members to share expertise amongst like-minded businesses and individuals. We plan on achieving this by hosting a variety of quarterly events throughout the year including local breakfast meetings and evening functions with guest speakers and professionals. We’re kicking off 2018 (a little late because of the bad weather) with our annual curry night at the Raj Bari, a local club sponsor, on Thursday 12 April, 7.00-7.30pm. Mighty Oaks Business, takes pride in supporting local sponsors and working together to raise money for charity. If you would like to come along on 12 April there is a cost of £30 per head which includes a 4 course set meal and a drink on arrival. 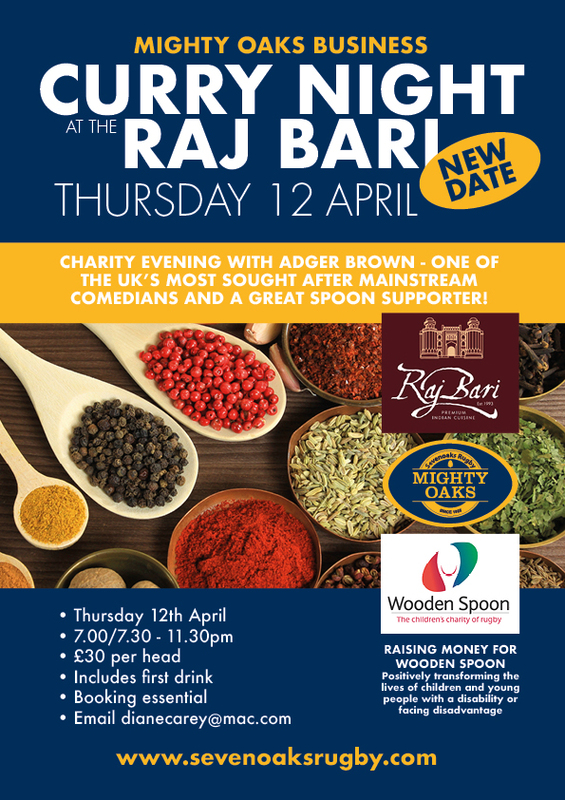 The Raj Bari will also be making a donation to our chosen charity, The Wooden Spoon, from the proceeds of the night. To book please email Diane Carey via dianecarey@mac.com. Payment needs to be made prior to the event to confirm your place.